Back in January, I wrote my first App Spotlight blog post here on Logical Juice, about Foursquare. Since then it has become one of the most popular apps available across all mobile platforms, and is now only days away from hitting the 1 million registered users mark. The popularity of the app gave rise to last week’s first annual Foursquare Day, the first globally recognized grass-roots celebration of the power of social media. Indeed, it was the power of social media that took Foursquare Day from being a simple idea to an actual live event: One day, an ordinary Foursquare user named Nate Bonilla-Warford had an interesting thought – why not celebrate the app on April 16 (reason being that four-squared equals 16), and have everyone “check in” to it on that day? He floated the idea around online, and it took off through the social web. It eventually caught the eye of Foursquare employees, who liked it, created an official 4sqDay badge, and set up their own party to join in the celebration with their users. I was lucky enough to have received an invitation to join in the festivities. 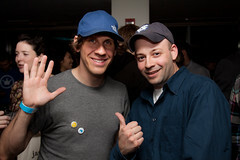 While I was there, I got to meet co-founder and CEO Dennis Crowley (who had time to snap a quick picture with me). The party drew quite the crowd, and featured Hollywood A-listers like Ashton Kutcher and Demi Moore, as well as big names in media and tech, like Digg CEO Kevin Rose. But the best part about Foursquare Day was that among the hundreds of party attendees were many normal, everyday Foursquare users – just like me. And that’s the beauty of Foursquare – it knows what makes its brand tick. It recognizes that its success rests in the hands of its users, without whom there would have never been a Foursquare Day. The truth is that conversations are taking place every day through Foursquare, and the company has chosen to join in, have fun, and celebrate not with a VIP-only who’s who list, but with the people who check in at their local Starbucks on their way to work every morning.